With the launch of Ping this week in the latest update for iTunes, Apple is finally adding social elements to its software. 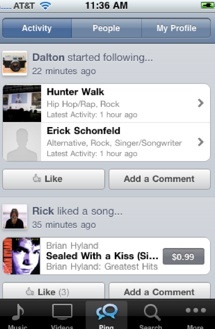 Ping is essentially a social music discovery feature in iTunes. You can friend, follow, or lurk to see what music other people on iTunes—people you know, people you don’t—like, review, or buy. Ping is very promising if only because of Apple’s reach through iTunes to 160 million music consumers. And it will no doubt get better over time. But at launch, it is riddled with problems which stem from the fact that Apple does not know how to create social software. It is completely out of its element, and it shows. The biggest problem I have with Ping is that it lives in iTunes. Not only does it live in iTunes, it is isolated there. iTunes is not social. It is not even on the Web. And Ping doesn’t communicate with any other social networks. I can’t see people’s iTunes Pings in Twitter, Facebook, or anywhere else. While Ping does make iTunes itself more social, the problem is that I don’t live in iTunes. It is a store. I go in to buy stuff and get out as fast as I can. I am not sure Ping is going to make me want to hang out there more. Let’s start with when you sign up. There is no easy way to find people you already know on Ping. Facebook Connect was supposed to solve that, but that feature is disabled until Apple and Facebook work out their differences. So what you are left with now is having to type in people’s names and hope they’ve signed up for Ping, or invite them one at a time through email. Hopefully nobody else has claimed their name. (The fight with name squatters and spammers is already beginning. Earlier today I found a dozen “Steve Jobs” accounts, which have since been cleaned up). There is no mechanism for importing your contacts from Gmail or any other email, or bringing in the people you already follow on Twitter or other social networks. That leaves you with the option of finding one or two early-adopter friends and clicking through their profiles to see who they follow and add the interesting people. The only people I can find right now are bloggers and tech folks I follow elsewhere for different reasons. I have no idea whether they have any taste in music, but I guess I’ll find out soon. Getting up and running should be easier than this But that is not the deal breaker. Once you start following a few people, you can see all the songs they “like,” rate, review, or buy. 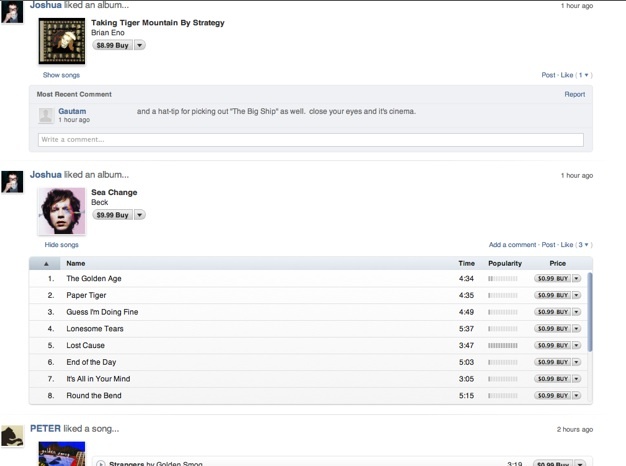 It creates a realtime activity stream which gives you social entry points into the iTunes music store. It also works on the iPhone and iPod Touch. But don’t be confused about Apple’s social ambitions. Ping is all about driving more sales in iTunes. It is completely separate from your existing iTunes library of songs. You can’t like a song while you are listening to your existing collection. If you’ve bought a song or album, Ping assumes you like it (bad assumption), but none of your actual listening activity appears in your stream. You can only like songs in the iTunes store. And even doing that isn’t easy. There is a big like button for each album, but if you want to like a song, you need to click the drop-down arrow next to the buy button. Be careful not to hit buy, unless you really like the song. Once you do like a song, that shows up in your stream with a nice big buy button for all your friends to follow suit. Of course, they can’t listen to the whole song before deciding to buy, only a sample. You can’t share playlists. You can’t really do much other than peddle music to your friends. Ping is just too commercial. It is not fun. There isn’t even a leaderboard or any visible game mechanics. There is no way to see which of the people you follow are the best music recommenders as measured by subsequent purchases from people who follow them, likes or any other measure. Ping is a promotional vehicle for iTunes and bands. If you follow a band like U2, it seems like they get a special account which allows them to upload videos (and who knows what else). Why can’t I upload photos or videos to my stream? I can’t even add a random comment or status update without first liking, rating, or buying a song or album. While I am sure Ping will help drive more sales, and is probably something I will check out whenever I am in iTunes to do something else, it is not as compelling as it could be. The most interesting information in iTunes is what your friends are actually listening to and what they think about the songs they know by heart—the ones in their music library. 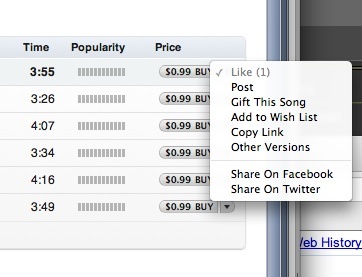 Simply allowing people to like or promote the songs in their existing collections while they are listening to them in iTunes or on their iPods would make Ping a lot better. Sharing playlists is another no-brainer. Ping could be so much more than it is: isolated, controlling, and a bit boring.